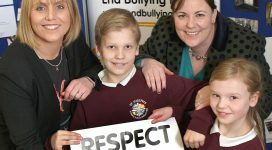 The Northern Ireland Anti-Bullying Forum delivers anti-bullying workshops to children and young people, and to their parents and carers, in schools and groups across Northern Ireland. These workshops provide participants with a great opportunity to develop a better understanding of bullying behaviour, it’s impact and we can work together to tackle it. Please note: NIABF does not deliver training for school staff. This is the remit of the Education Authority. All requests for staff training should be directed to your local EA Office. Anyone wishing to request a workshop should complete the NIABF Workshop Request Form and return it to us at info@niabf.org.uk. Once we receive your completed request form we will process this and, if your organisation meets the criteria, your request will be put on our waiting list. When your request reaches the top of the waiting list, we will contact you to discuss your requirements and arrange the date and time for the workshops. Please note, a member of staff must attend all workshops with young people. Workshops are delivered throughout the year. However, as demand is usually very high we recommend submitting a workshop request form as early as possible.